The kitchen really is the heart of the home. In the kitchen, you and your family share so many great meals, conversations, and memories. Why should all this fun be limited to the interior of your home? Did you know the kitchen can also be the heart of your back yard? 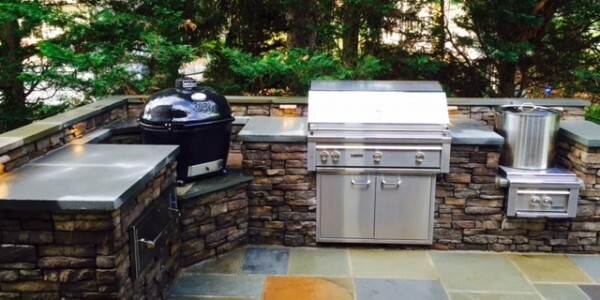 Building an outdoor kitchen is a unique project with a plethora of benefits. At O’Grady’s Landscape, we specialize in building outdoor kitchens for our clients. As the top landscaping company in Northern Virginia, we love helping our clients build beautiful outdoor spaces that fit their everyday lifestyle needs. Our streamlined, customizable process puts you at the forefront every step of the way, from piecing together the perfect design to bringing your vision to life. An outdoor kitchen, of course, lets you enjoy more cooking space! Although you aren’t likely to cook your daily meals outside just because you have limited counter space in your other kitchen, the outdoor kitchen serves as great backup, especially for special occasions. If the kitchen is full while you’re trying to prep Thanksgiving dinner, cook some of it outdoors! Hosting a barbecue? Prep and cook the entire meal right there on the deck. Summer is almost here, and if you are looking forward to spending much more time outdoors in the sunshine, adding an outdoor kitchen is the perfect way to ensure you have extra entertaining space. Host the best pool party on the block by grilling up some burgers and serving other great snacks next to your pool. Host your child’s birthday party on the deck and cook everything in front of the party guests. Outdoor kitchens can be built using a variety of materials and in a variety of layouts that really complement your home’s exterior style. Just like indoors, choose the perfect countertops and cabinets to really make the space your own. You can have your oven blend in with your cabinet materials like stone or wood for a seamless, sleek appearance. Pair your outdoor kitchen with an awning for extra protection and aesthetics. Everybody can appreciate increasing their home’s equity. A variety of renovation projects can help boost home value, and outdoor kitchens are no exception! You can enjoy a higher ROI for these projects, since the home’s increased value helps offset the cost of the project. This especially comes in handy if you are renovating to sell, or may possibly sell in the future. Or, even if you have no plans to sell, an outdoor kitchen improves your home all around! 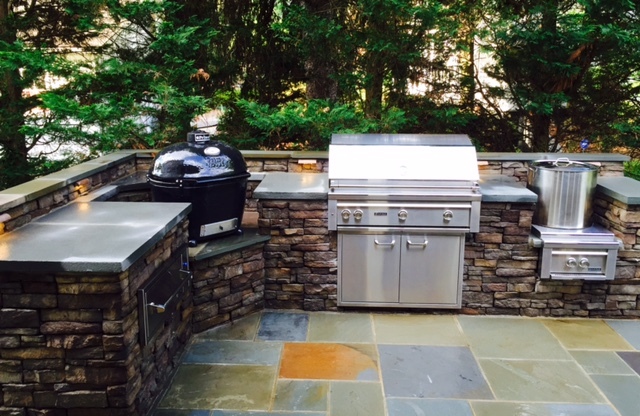 O’Grady’s Landscape offers outdoor kitchen installation in Northern Virginia. Before starting your project, we help you determine your design by ensuring you consider how much space you have, what you plan to use the kitchen for, how many people you need to fit in the space, and other details. Once we ensure the design matches your lifestyle and functional needs, we help you choose all the kitchen essentials including ovens, refrigeration, sinks, burners, and more. Contact us to tell us about your outdoor kitchen project!